The hottest thing to hit dirt track racing in years are these grinding discs. Both disc have a 7/8" arbor. 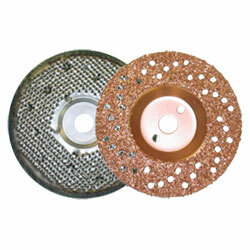 The 7" 16 grit copper color disc will bring old tires back to life and put fire back in to that dead rubber. Good for sprints, modifieds, and late model tires. The 4" 24grit disk is good for karting, bar stool racers, and mini cup tires. The 7" siping disc is super aggressive and will put round sipes in your late model tires. NOTE: These are dangerous to use! You need to have the tire mounted on a wheel & have it bolted to the car or to a holder. Do not try to hold this with your legs or hands while grinding. YOU WILL GET HURT! !